The Learn pillar is about helping members to better understand Ghana's culture, history, politics and economics. Below are details of a handful of meet-ups we have held over the years, under our Learn pillar. In October 2018 we held the first installment in our new ad hoc series on diaspora investing. The focus for this instalment was on investing in Ghana-related Small and Medium-sized Enterprises (SMEs). 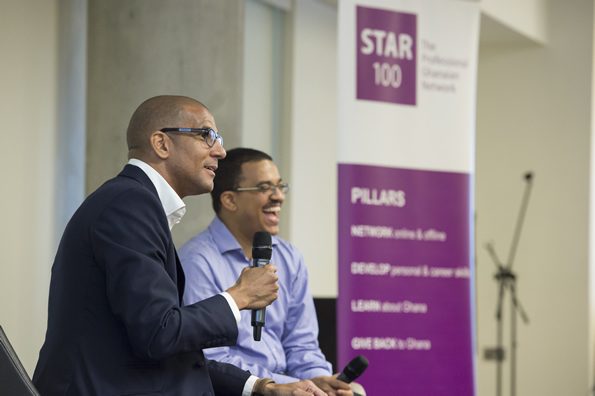 Our invited panellists, Mike Mompi (Investor and Co-founder, Clearly Social Angels), Nelson Amo (Co-founder & CEO, Innohub) and Andrew Hunt (Co-founder & Managing Director, Aduna), engaged in an extremely informative and interesting conversation, moderated by Star 100 Chair, Richard Tandoh. In October 2015 we held the first installment in our second series on Ghana's tribes. It focused on chieftaincy. The speakers were Alhassan Mbalba (Dagomba), HRH Naa Tsotsoo Soyoo I (GaDangme), Akwasi Amponsa-Afrifa (Akan) and Dr. Ambrose Togobo (Ewe). 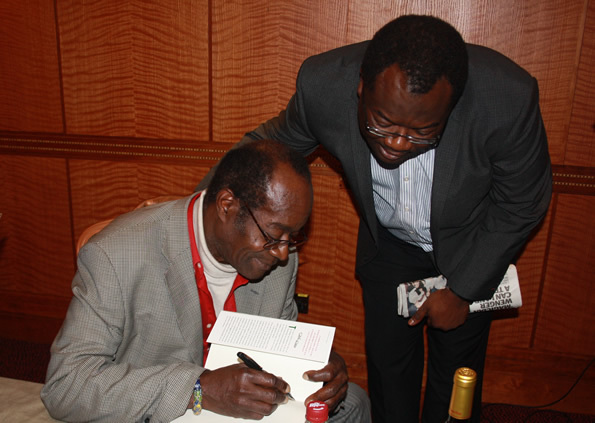 The session was moderated by Dr Kwadwo Osei Nyame, Jnr (SOAS Centre for Cultural, Literary and Postcolonial Studies) - pictured below. Our previous series, which ran from 2008 to 2013, focused on Ghana's main ethnic groups' beliefs and rituals in relation to birth, marriage and death. 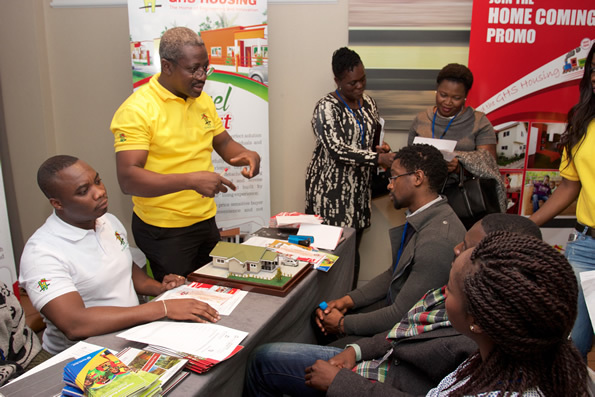 Also in October 2015, we held Ghana Property Seminar 2015, a half-day exhibition and seminar, which saw us apply our expertise in delivering engaging events to a space already well-trodden by others. It was a big success. A full house saw some 140 delegates gain an overview of the property market in Ghana and learn about areas including financing a purchase, legal and tax considerations and general day-to-day matters such as maintenance. 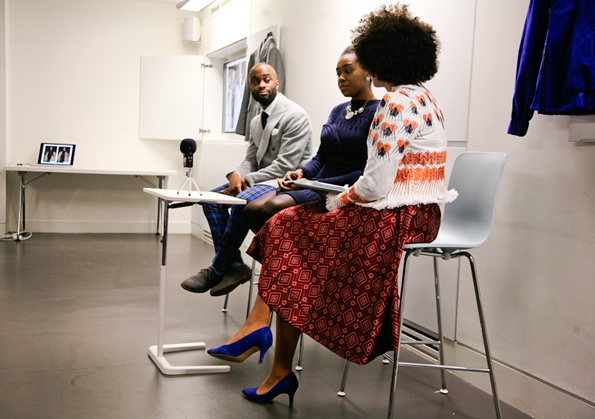 This event in March 2015 featured a conversation between Beatrice Korlekie Newman (Owner and Creative Director, Korlekie), Lee Marsh (Owner, Lee Marsh Bespoke) and Kiran Yoliswa (Styled By Africa). 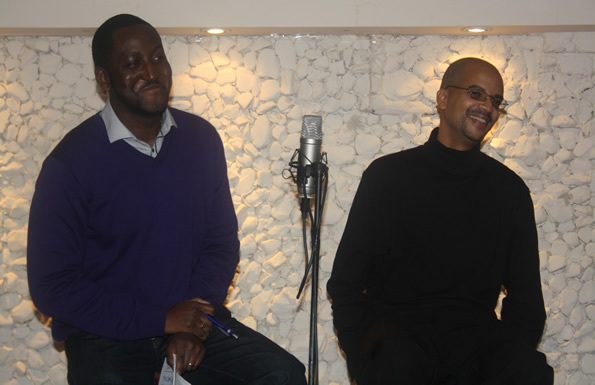 Both designers spoke about their personal career journeys. They also showed and spoke about pieces from their latest collections. In October 2014, we orgnaised a 10th anniversary conference, Road Map Ghana, where individuals with defined ideas and strategies for Ghana’s future development (Thought Leaders) shared their road maps for Ghana whilst Ghana-focused individuals making a difference in their chosen field of endeavour (Change Makers) shared their personal road maps. 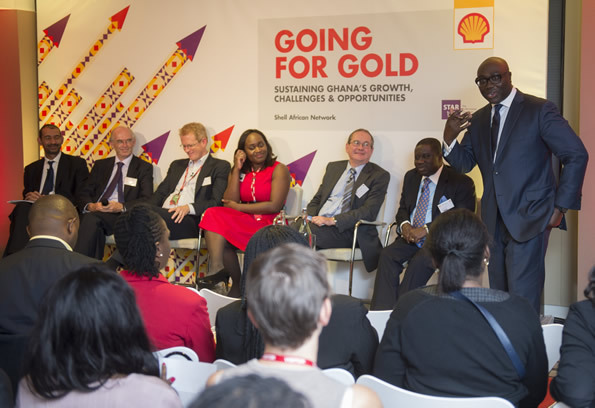 The conference featured 13 speakers - Kojo Abedi (then CEO, ExplainerDC), Tutu Agyare (MD, Nubuke Investment), Nicole Amarteifio (Creator of An African City), Dr Sylvia J. Anie-Akwetey (Fellow, The Royal Society), Matthew Boadu Adjei (CEO, Oasis Capital), Ernest Davids (CEO, WAVES International), Ernest Hanson (Director, Beaufort Properties), Todd Holcombe (Senior Faculty Member, The Meltwater Entrepreneurial School of Technology), Elikem Nutifafa Kuenyehia (Managing Partner, Oxford & Beaumont), Emma Orefuwa, Jerry Parkes (MD, Injaro Investments), Ade Sawyerr (Partner, Equinox Consulting), William Tewiah (MD, Zen Petroleum & Star 100 Founder; pictured with Richard Tandoh, current Chair of Star 100 UK) - ten of whom flew in from Ghana. his own journey to founding Oxford & Beaumont. Sectors contributing most to Ghana's growth. Areas of opportunity for the diaspora to create businesses, work and invest. Policies Ghana’s next government needed to put in place to attract entrepreneurs and investors. Sectors Ghana needed to further develop to solidify its position as a Middle Income Country. 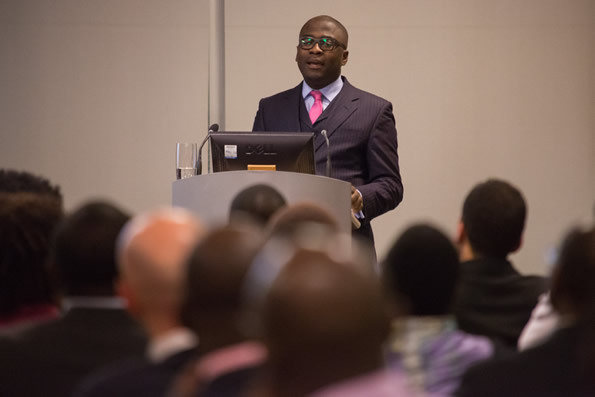 The event was moderated by the late Komla Dumor (BBC World News, Presenter of Focus on Africa). 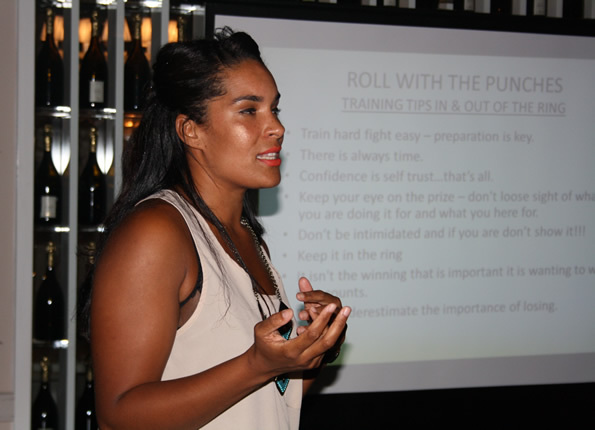 Ahead of the London 2012 Summer Olympics, Lesley ‘Super’ Sackey, a British female boxer of Ghanaian decent, spoke to Star 100 UK about her career to date and shared her thoughts on female boxing in Britain and Ghana. What sets Ghanaians apart from all other nationalities? What habits do we possess that help/hinder us? What characteristics are shared by Ghanaians in Ghana and in the Diaspora? Why does exploring such issues matter for a group like Star 100 UK? 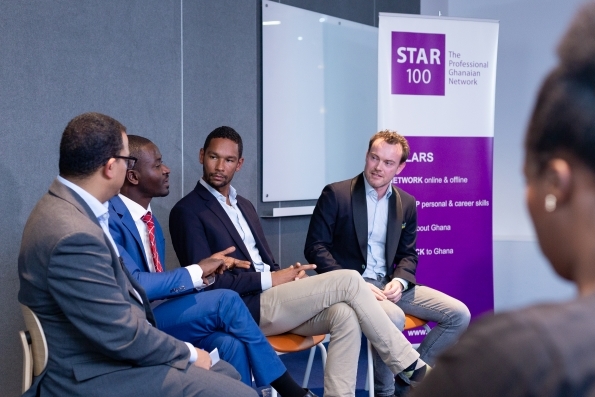 In April 2012, Ben Fletcher (Star 100 UK Membership Coordinator) moderated a discussion with Seth Tandoh (Founder, The Leadership Ghana Forum), that addressed the above questions and more. revamping the nation’s attitude to wealth creation. 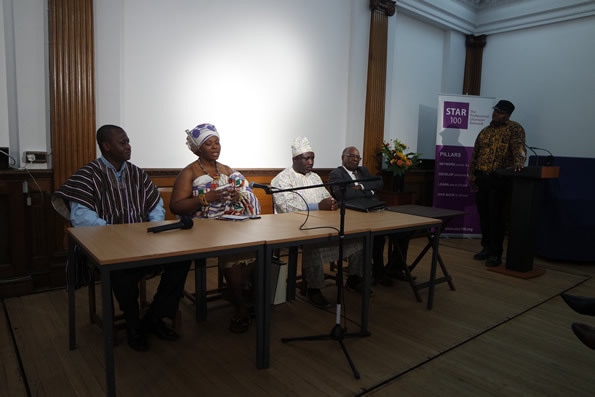 In June 2007, Star 100 UK hosted June Milne, one of a handful of people that knew Kwame Nkrumah during his time in excile in Conakry, Guinea.